This is an excerpt. Read more at the Washington Times. Dems are so bad. If I had a magic wand, I’d make illegals vote Republican. How is this crap NOT HIGH TREASON, i don’t know.. May the next revolution come soon, and just be brought to the heads of these abject traitors.. PREFERABLY via a guillotine. This is a situation where the millions of legal citizens in this nation need to be given the standing in the Supreme Court to sue all local, state & federal govt entities, including Congress, for criminal malfeasance by legislating to permit unlimited millions of foreign national non-citizens to subvert / disenfranchise legal citizens of their vote & their right to representation based on their US, not foreign, citizenship. We are at the point of no return with a corrupt rogue & unconstitutional govt, judiciary & powerful cheap labor business interests or Socialist saboteurs that are hellbent on gaining absolute power via unilaterally bestowing voting power & citizenship rights to however many millions of foreign nationals who illegally enter. Aliens here illegally cannot be allowed to vote & thereby dictate for themselves their status from being illegal to legal, which is obviously contrary to & against the interests of legal US citizens. The American Revolution & subsequent constitution is a testament that the legally recognized citizens of USA will not be governed by the dictates or interests of foreign nationals, especially not those illegally in US. This proves that the traitorous Liberal Democrats are domestic ENEMIES of the U.S.A.. We as rational citizens should and must defend our country against this destructive Liberal Democrat Political Party!!!! VOTE THEM OUT!! Scruffy – I took the same oath when I enlisted in the Army. That is a lifetime promise and I agree with you completely. The libs know they can’t win without cheating and this is just another attempt by them to follow their Commander-in-Cheat (Hitlery) and expand the cheating. Scruffy….I took the oath in 1961 (Army) and it has never expired for me! It is as active and valid in 2019 as it was in 1961! At age 78 I am now less able, but still fully ready and willing to serving my country again! HURRAH! Unless we can purge our courts of the libtard judges, ANY Such lawsuits will be doa.. 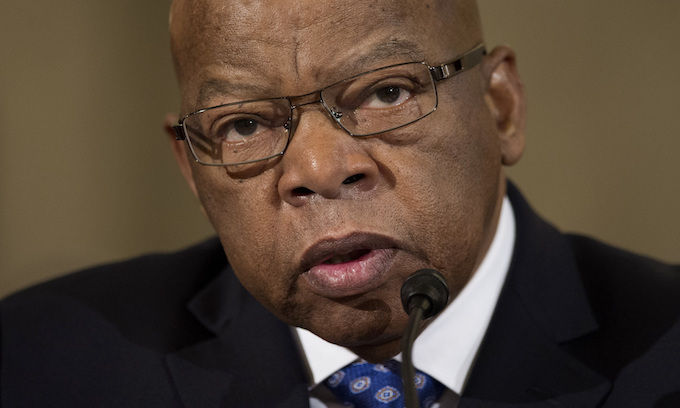 Especially out in Commiefornia, where the 9th circus reigns supreme..
Don’t know why they call this guy Lewis a ‘hero’ of the civil rights movement. He was just the slowest one running across the bridge, that the Ala. State troopers caught and beat. Now he’s stupid and that makes him an icon. The DEMOCRAT PARTY has ended. They are totally out of their minds. Not one of these crazies would vote yes for Kate’s law to help protect Citizens, and now they think it is ok for ILLEGAL IMMIGRANTS to vote. That is the last nail in their coffin! The DEMS allowed the Socialists and Communists, along with the ANTIFA idiots into the party . They have lost ALL control. Until i see the VOTERS kicking them out enmass, i wouldn’t be too quick to say its ‘their death knell’..
Of course they do! They want the votes in 2020! They’ll do anything to steal the election – underhanded, unethical, doesn’t matter. They’re scared they won’t have the votes to win, so they want to create the votes. It’s the modern version of the old cartoons from the 30’s of politicians copying down names off of tombstones. Well, sadly, ctgng, they still register the DEAD to vote, too–and any OTHER source of fraudulent, illegitimate votes they think they can get away with. And if THAT doesn’t work, then they just demand recounts until they can “find” enough fraudulent ballots to win the election. I’d be willing to BET that an HONEST count of actual legitimate ballots cast in 2018 would reveal that the conniving Dems did NOT win that House majority they now are exploiting in their frenzied attempts to overthrow Pres. Trump and COMMUNIZE our country! These conniving Leftist SCUM can no longer WIN an honest election–so they resort to EVERY form of vote theft and FRAUD known to man to STEAL THEM. With the internet, deaths reported in the newspapers all over, they don’t need to go down to the graveyard to ‘write down names from tombstones’..
And they shall dwell on welfare for the rest of their lives…. and vote for the democrat party so that they and their children can to stay on the tax payers dime. Well, of COURSE they are in favor of letting illegals vote, because they are so far gone in their radical Left LOONERY that NOBODY with any sense will vote for them, so the ONLY way they’re going to win an election is resorting to VOTER FRAUD–which they would just LOVE to legalize by letting ILLEGALS vote, in TOTAL violation of the Constitution and our laws. Pity there’s PLENTY of americans not in their right minds.. Look at NYC, Ca and Seattle for example. The FIFTH COLUMN has arisen and it is to be found in the Congress. The enemy is not at the gates, it is in side the walls of the government. At the moment too many factions in the Democrat Party are vying for power that no one socialist can rise to be the Supreme Dictator! It’s been there for decades, and imo its too late to exize it without a bloody revolution. The present Democrat Party is a DISGRACE to our US, and to our Constitution ! These people want votes, and they don’t care HOW they get them. The ONLY people voting Democrat at this time in history, are either weak brained liberals, or Illegal immigrants ! Once more the democrats are proving themselves to be the party of lawlessness and treason, hard to imagine the party that was once decent has descended so far! I thank them for making it clear where they stand, it makes voting a lot easier! But they are free to do this, as long as they accept the cost! I think they should let house pets vote. Well, with how man folks i see, calling their dog or cat, their ‘furry children’, it wouldn’t shock me one bit, to see them move onto letting animals vote (all controlled of course, by their human owners)… JUST so the rabid dems can expand their voter base of course. Democrat Party has become the party of sedition, poor education, open borders, and the most vile form of government ever conceived, socialism. There is little in the form of “news” programs anymore. All is narrative and most of it is the tiresome robotic Leftist narrative. Only OAN and FOXNews give news. OAN is the best.